People who plan to spend many hours at the beach often bring a beach umbrella with them. This provides them with a chance to get out of the sun’s harmful rays for a while. The best beach umbrella is one that provides plenty of sun coverage along with a protective undercoating that blocks UV rays. Our top pick, Tommy Bahama Beach Umbrella, is a large, colorful beach umbrella that provides plenty of room for two adults to sit under comfortably. Going to the beach is a lot of fun and it’s easy to lose track of time and spend more time exposed to the sun than you should. Over-exposure to the sun can cause serious health problems such as heat stroke and sun poisoning. Because of these dangers, you should be sure to bring a good quality beach umbrella with you when you will be exposed to the sun for any length of time. If you’re looking for a good beach umbrella you should take some time to do a bit of research before you settle in on your choice. There are many considerations to think about when looking at beach umbrellas such as which brand makes it, are there any new features and designs available, what is the quality of the construction, and other factors. We will help you make the best decision you can so you can feel confident that you have purchased the best beach umbrella for your needs. The tools provided you will make the research and decision making process much less overwhelming. You’ll have plenty of sun protection with this 7-foot beach umbrella from Tommy Bahama. Features include an undercoating made of special aluminum that protects you from the rays of the sun. The wind vent adds more stability so the umbrella doesn’t blow away. The sand anchor secures the umbrella into the sand with just a twist. The telescoping pole allows for different heights if you choose to use it. Setting the Tommy Bahama umbrella up doesn’t get much easier than this. Just use the handles that fold down to screw the base of the umbrella into the sand. Next, clip in the top part of the umbrella and tilt it in whatever direction you want. The umbrella is rated 100 SPF allowing users to spend all day at the beach without needing to worry about getting blistered and burned. The storage bag makes transport and storage very easy. 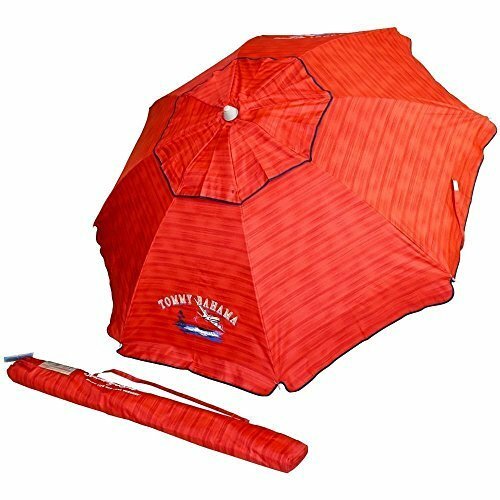 It is the perfect beach umbrella for your beach excursions. Tommy Bahama umbrellas are available in a multitude of fun, beautiful, bright colors. This super lightweight, 7-foot beach umbrella weighs less than 3 ½ pounds and provides you with a UPF (Ultraviolet Protection Factor) of 50+. It blocks over 99% of all the UVA and UVB rays so you can hang out on the beach longer and not worry about getting burned. It is the only “beach umbrella with sunshield combination” that blocks this high amount of the sun’s harmful rays. It will keep you a lot cooler as well and you can add more sunshields if needed. The unit can hold up to 4 shields. Due to the way that the sun’s rays can bounce off the sand and water, just using an umbrella alone doesn’t provide full protection. 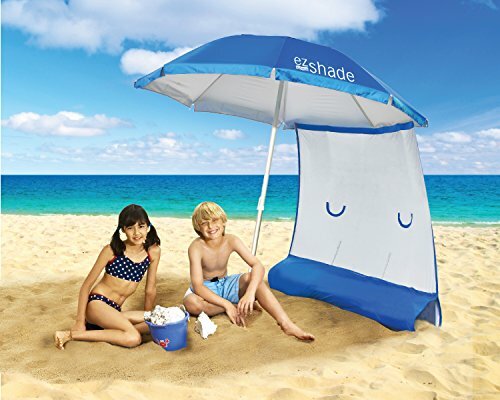 The ezShade and Sunshield combination is perfect for bringing your little ones out to the beach yet still giving them ultimate protection from the sun. The shield attaches easily anywhere along the bottom of the umbrella. Keeping it in place is easy, just weigh down the pocket at the bottom of the shield with sand, water bottles or other items to keep it from blowing. This beach umbrella from EasyGo provides you with 8 feet of brightly colored protection from the sun. The easy tilt adjustment makes it simple to keep the sun off you as the day progresses. The 16 ribs of the umbrella are UV coated for sun protection and are made from durable fiberglass. The canopy is vented for improved air flow too which prevents the common ribs-inside-out problem that cheap umbrellas might experience in windy conditions. The aluminum pole of this EasyGo beach umbrella is rust-free and lightweight. It has several height adjustment choices that you can try for the maximum amount of sun protection and comfort. There is also a tilt adjustment that allows the umbrella to follow the sun’s track. The convenient storage bag makes transport easy. You won’t have any trouble getting the pole into the ground securely thanks to the screw-base auger which makes it easy to anchor the umbrella so it won’t blow away. 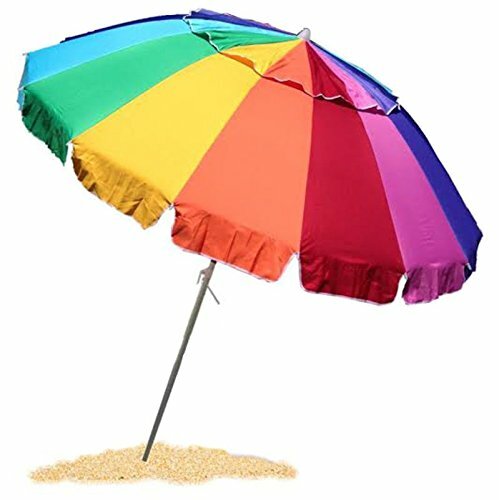 This colorful and large beach umbrella will provide you with as much protection as a tent would. People love to go to the beach and spend hours playing in the waves, building sand castles, and enjoying any number of other activities. The problem with being in the sun for hours is that it leaves you open to a possible case of bad sunburn and other heat related problems. A good-quality beach umbrella can allow you to be on the beach longer without having to worry about severe sunburn and heat exposure. Using beach umbrellas along with a good sunscreen is a great way to battle the UVA/UVB rays that can cause damage, especially to little ones’ sensitive and delicate skin. There are many different colors, styles and sizes of beach umbrellas on the market. Some are free standing, some attach to your chair, and others have additional sun protection through attached sunshields. The three, top-rated beach umbrella choices reviewed above are the type of high quality beach umbrellas you want to look for when making your purchase. All three of them offer loads of sun protection and the ezShade offers a sunshield that is perfect to use when you have children or babies on the beach. Read the buyer’s guide below to learn about the different types of beach umbrellas and how to choose the best one for your needs. This information will make the research and selection process much less stressful. Beach umbrellas can provide the user with many benefits. It is these benefits that make people like using them so much. We have listed these important benefits below. Protects you and your family from UV rays – Many beach umbrellas have a UV coating on the umbrella fabric that protects users from the UVA/UVB rays. The coating keeps the UV rays from penetrating the fabric and getting through to you. Makes sun blocking more convenient – Rather than chasing shade around, all you need to do with a good quality beach umbrella is move the tilted top portion to block the sun and you’re protected. Offers Rain Protection – Sometimes it does rain when you’re out on the beach enjoying the sand and waves. A good quality beach umbrella can offer your protection from the rain, too, if it is water-resistant. There are several things you want to look for when you start researching beach umbrellas. We have listed these important factors below so you can ensure that you will purchase the best possible beach umbrella you can get. Tilting Function – Not all beach umbrellas can tilt, but this is a very popular feature that beach-goers like. Instead of having to move the whole beach umbrella around to block the sun as it moves, the tilting beach umbrella allows just the umbrella part to be tilted to block the sun. It is very convenient to use and makes it very easy to block the sun. Umbrella Design – With the many different design styles out there, you can easily find a beach umbrella that will match all your needs if you take your time and do a bit of research. Do you have little ones that will be in playpens? Look for a beach umbrella that has side panels which will offer more protection. Make sure that the design is sturdy and will not blow in the wind as the beach can often be windy. Umbrella Size – The size of the umbrella will determine how many people will be able to enjoy the shade. In general, a 7-foot umbrella can shade two adults comfortably and you won’t have to squeeze together. If you have a large family, you are better off purchasing several beach umbrellas to give everyone a place to sit out of the sun. Protective Undercoating – This undercoating is crucial to helping the beach umbrella block the UVA/UVB rays. Beach umbrellas without this coating will allow the sun’s rays to penetrate right through the fabric. The SPF rating of the umbrella will be determined by the type of undercoating that is used. The higher the rating, the more protection you will have. Carrying/Storage Bags – A carry bag makes carrying the umbrella much easier and more convenient. The portability of the beach umbrella will be determined by its weight, the ease of assembly and disassembly, and the size of the bag it is stored in. Umbrellas that break down into smaller pieces are much easier to carry than one that is all in one piece. Choosing the right beach umbrella doesn’t have to be confusing or stressful. With all the choices on the market there is a beach umbrella for every need and taste out there. First determine your needs and preferences then start looking at the different choices to see what fits those needs. Don’t base your decision only on color. While a pretty design may look great on the beach, if it doesn’t have good protection, ease of assembly, or adequate size, the design isn’t going to matter. The three, top-rated beach umbrellas featured above are all excellent choices for those who want increased protection. They all have undercoating for increased UV protection, they are easy to assemble and take apart, and one of the choices, the ezShade, has sunshields that can increase your protection even further. Any one of them would make a great beach umbrella for your outings. Remember that only two adults can fit under an umbrella that is about 7-feet wide, so take that into consideration when you are looking at the different types, sizes, and designs. You may have to purchase more than one umbrella to make sure everyone has protection. Never settle for a beach umbrella that does not meet your needs and don’t only look for the cheapest model. Even if you have a tight budget, you can find the best beach umbrella within that price point by taking the time to compare and research many different models in your budget range. Reading reviews is an excellent way to gain insight into a product’s value. Customers are happy to tell others what their experiences are, so look at those reviews and comments to see what people have to say about any beach umbrellas you are interested in. It will help ensure that you choose a product that you will be pleased with for many, future beach outings.